UNITED NATIONS, December 15, updated Dec 16 -- Russia abruptly called a Security Council meeting for Thursday at noon, acting in its national capacity while still serving as Council president for December. Earlier on Thursday various Western Permanent Representative told Inner City Press they did not know what the meeting would be about, other than the stated topic: "Situation in the Middle East." This was the topic agreed on when Navi Pillay briefed the Council on Syria, and took questions on Palestine. So would Russia be making a similarly hybrid move Thursday at noon? Sources close but not the closest to Russia whispered darkly to Inner City Press about Syrian rebeled getting armed, 28 security forces killed. Would Russia be asking for a briefing? Update of 11:53 am - while some remain tight-lipped saying only that the noon consultations are about "the situation in the Middle East," there is more and more talk about the 27 security forces killed in southern Syria. 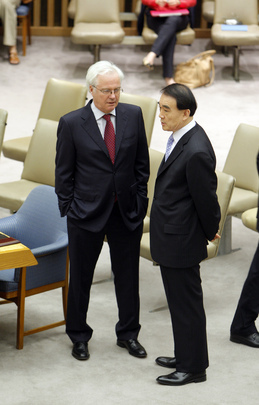 Some wonder: what proof, in terms of arms flows, does Ambassador Churkin have? Syrian Ambassador Bashar Ja'afari went into the Council earlier, stopping to offer Inner City Press a "complete" DVD of Barbara Walters' interview with Bashar Assad. That may be superseded. Update of 12:30 pm -- Inner City Press ran to the UN noon briefing and asked Associate Spokesperson Farhan Haq about the 27 soldiers killed, the topic of the Security Council consultations - did the Secretary General have any response? Inner City Press asked about Russia's reported concern about who may be arming the Syrian rebels, what does the Secretary General think? "We don't have verification," Haq said, "the Secretary General's concern is about all the violence, from whatever quarter and [wants] Syrian authorities and concerned countries around do what they can to put an end to this." Does that mean not arming the rebels? Back at the Council, the consultations began. Update of 1:25 pm -- Russia introduced a draft resolution on Syria. Inner City Press asked the Permanent Representative of Syria, Bashar Ja'afari, what he thought of the draft, as Ja'afari returned with the promised DVD he said has the full 59 minutes of Bashar al Assad's interview with Barbara Walters. On the resolution, he said it's a "further step in the right direction" and promised more extensive comments after checking with Damascus. The Russian position is that they are not catering to any country. At the stakeout, in the absence of UK Permanent Representative Mark Lyall Grant, the UK Political Coordinator Michael Tatham did a rare stakeout, to make a statement -- but then didn't take any questions. We hope to have more - watch this site. Update of 4:30 pm -- when Russia's Vitaly Churkin came to read a Council press statement about Iraq - Kuwait, Inner City Press also asked him what he thinks the next steps are on his Syria draft: consultations at the expert level? He said that the stakeouts after his -- by France, Germany and the UK -- showed these countries haven't "yet digested" the draft. One of these three commented to Inner City Press, it's a bitter nut. That the US didn't do a stakeout similar to the three Europeans just after Churkin circulated the draft might not only be because the US Permanent Representative was speaking Thursday morning in Washington about South Sudan, but reflect again a difference in US and EU policy on Syria. Notably, Hillary Clinton in Washington said among other things that the US would like to "work with" Russia on the draft, which criticizes acts of violence by "all parties, including disproportionate use of force by Syrian authorities" and "the illegal supply of weapons to the armed groups in Syria." We'll have more on this. Update of Dec. 16, 11 am - Churkin this morning says they need time to "absorb" the draft. Since yesterday he told Inner City Press the European members had yet to "digest" the draft, does the shift to "absorb" represent some step forward. "Maybe Monday," Churkin added, more talks. Watch this site.